Call of Duty: World at War: Zombies includes three control options including dual stick, tilt and swipe look. It's not the most ideal method of playing, but it appears to work. As we've said there's built in online matchmaking included for four player, though there's no way to communicate with your teammates. Only one map is included, which looks to be based off the original Nacht der Untoten map in the full game. 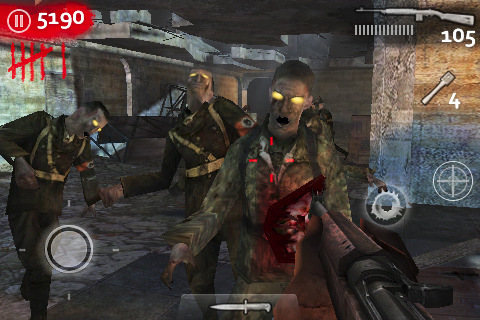 Call of Duty: World at War: Zombies it out now for the iPhone/iPod touch and will set you back $9.99.